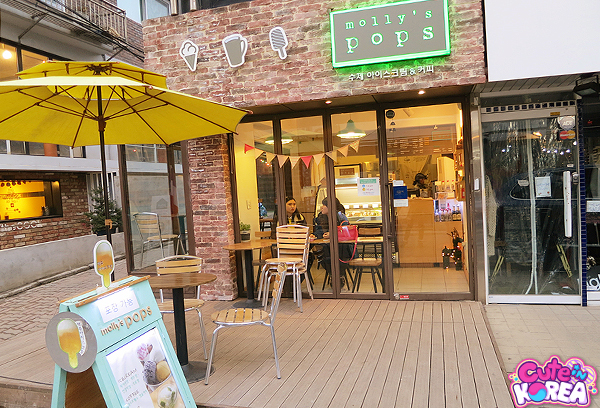 This little Popsicle shop is off the main crowded streets of Hongdae on trendy, more quite back street. 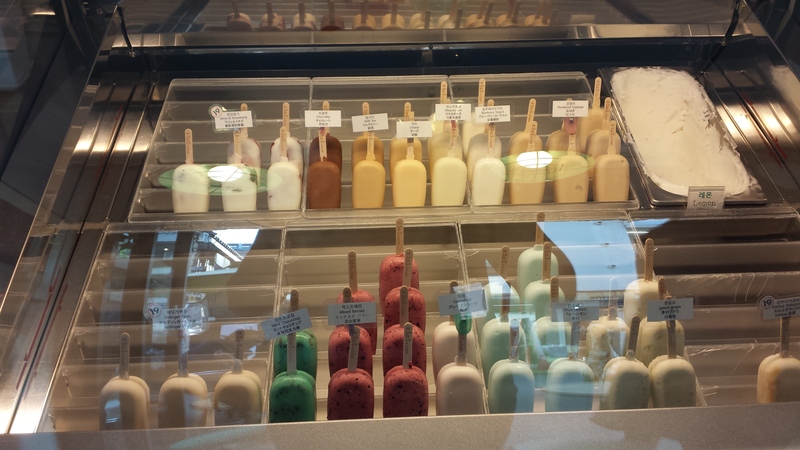 What makes this Popsicle shop so interesting is all the crazy flavors of popsicles it has. 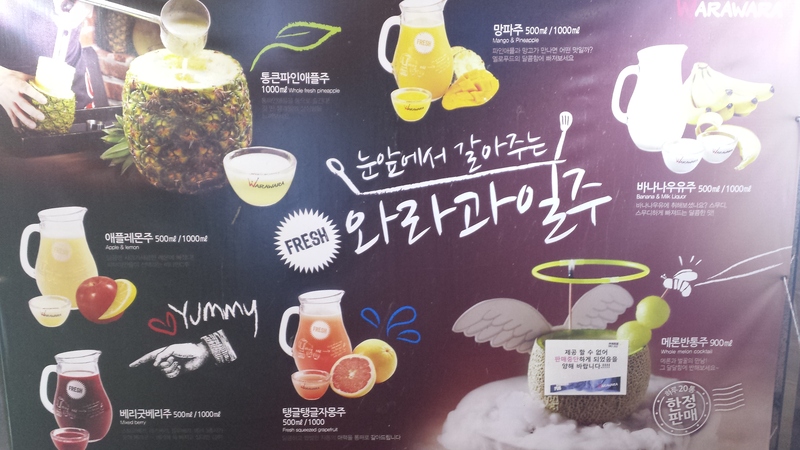 It features flavors such as Wasabi, Cheese, Makgeolli, Erdinger Beer, Soybean, and many other strange flavors. It also has more normal flavors for those who aren’t feeling adventurous. My friends and I enjoyed trying the Erdinger Beer and Makgeolli flavoured pops, they tasted as the flavour suggested and was a perfect treat on a warm day. We enjoyed siting on the cute patio outside the shop while talking and people watching. 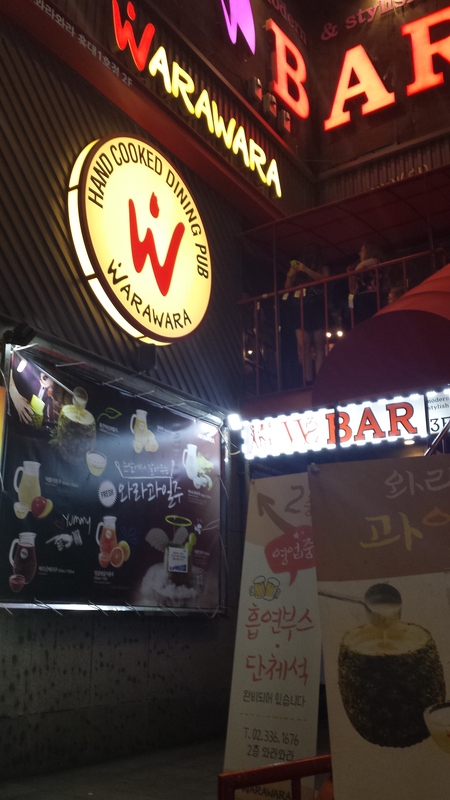 Warawara is a Korean Fusion Pub, it has multiple locations throughout the city, but the one in Hongdae was a lively place to go on a Saturday night for food and drinks. My friends and I went there before going to “the playground” where many people drink late at night (it is close by) and then to one of the popular Hongdae clubs. This pub has great food for sharing with friends, but what we loved about this place was the drinks. They feature alcoholic smoothies with real fruit in them. 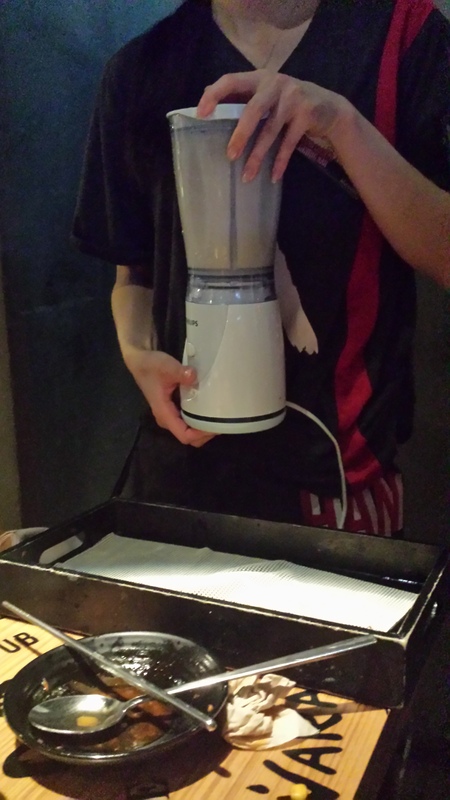 They bring a blender to the table and make the smoothies right in front of you. 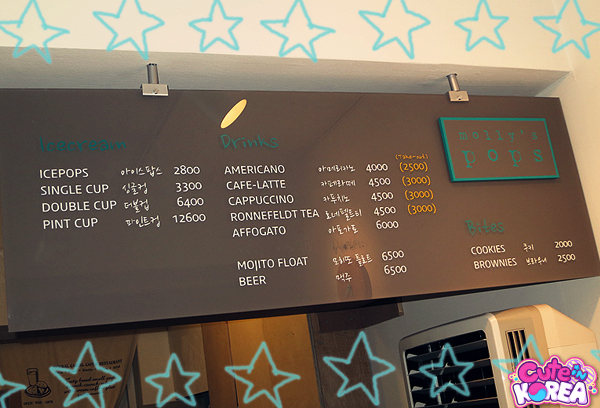 Some have Makgeolli in them, others have harder alcohol, most of the smoothies range between 7% -12% alcohol content. 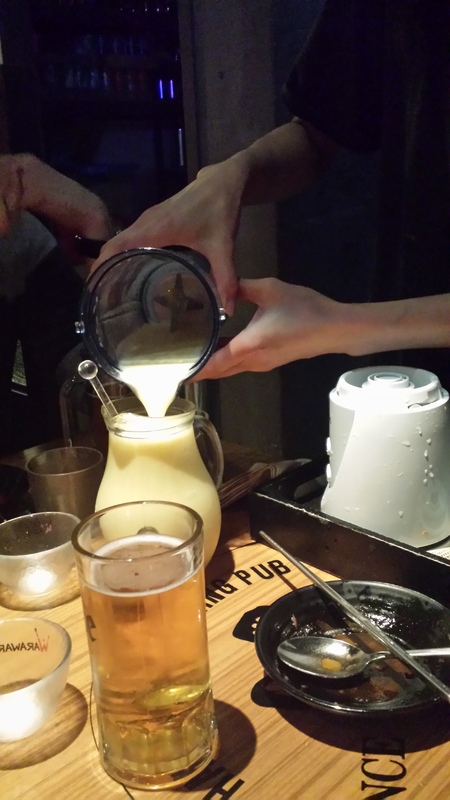 They also have large pitchers of beer, soju, makgeolli, and anything else you would like to drink. My friends and I tried the Bananna Pineapple smoothie and the mango smoothie and they were both delicious. This is also a good street to be on later in the evening because there are many bars and places to hang out, I suggest taking the Subway to Sangsu for the easiest walking route to the bar, but if you don’t want to transfer, then take the green line all the way to Hapjeong station. 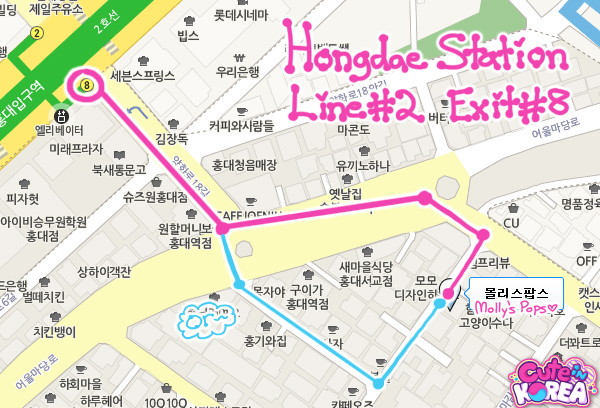 It is definitely walkable from Hongik University station though if you are exploring the Hongdae area. 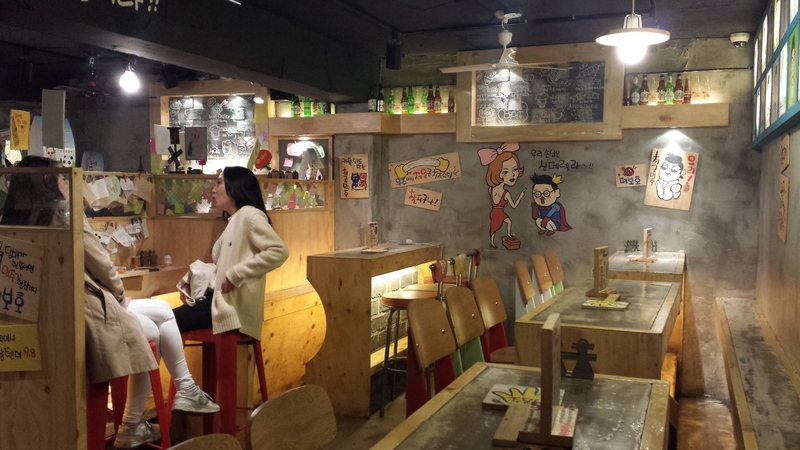 This is one of the cutest places in Hongdae to grab a beer with friends. 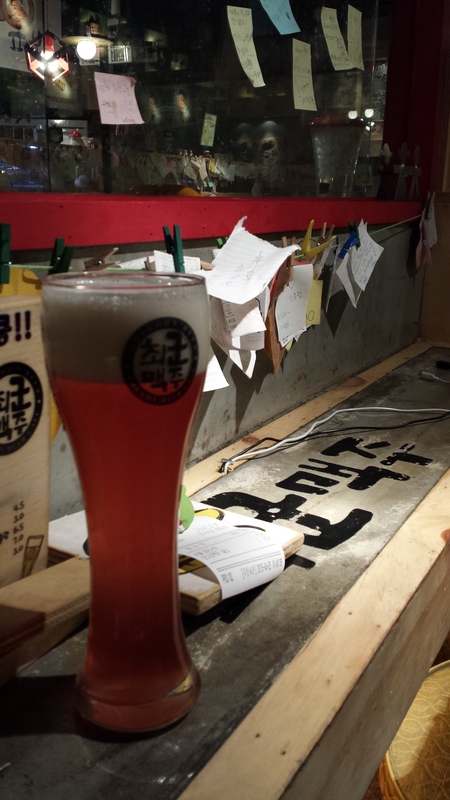 If you haven’t yet tried on one of the Korean Creamy Honey Beers or a Fruit flavoured beer this is the place to go. The décor is very cute. It features tall counters with high chairs, with lots of post it notes everywhere and cool drawings on the wall. 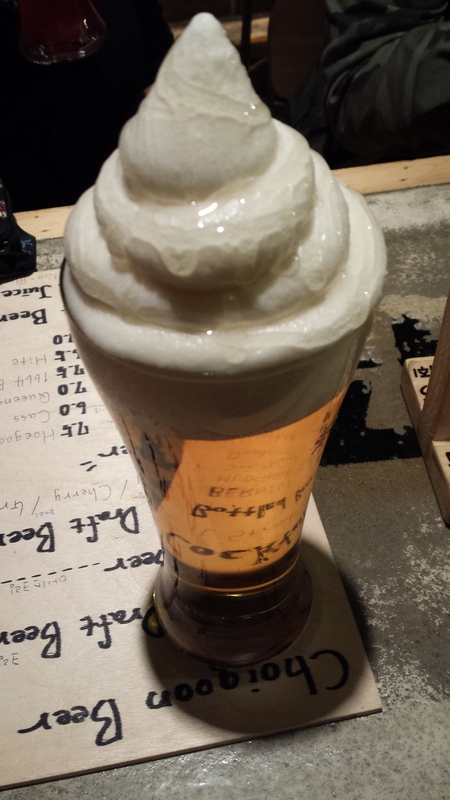 It is relatively small and has a good atmosphere, the beers are approximately 3,000 KRW, so not too expensive, although be warned you do have to order at least one food item. However they have lots of good snack food like fries, cheese sticks, octopus, and chicken strips. 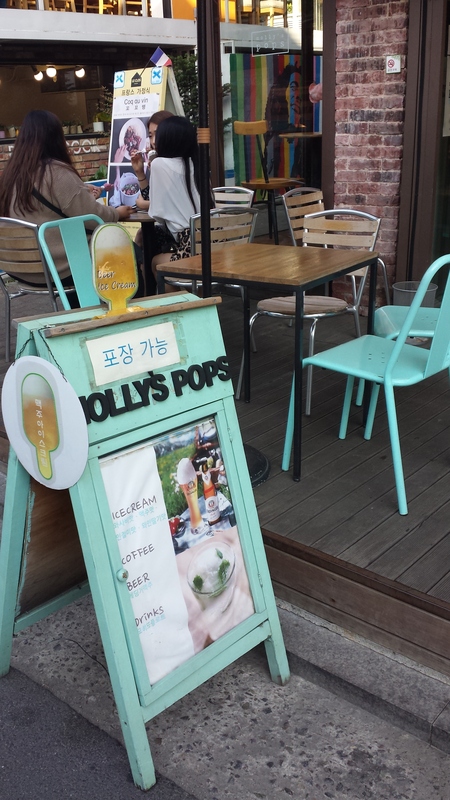 There are two locations in Hongdae . Location 1: Take Hongik University exit 8, walk straight until you see the Churro Shop, walk two seconds past it and you will see the sign to walk into the building on the right hand side and walk downstairs. Location 2. Take Hongik University Station exit 9, walk straight to the main street with the street performances. Turn Left and walk to the end of the street and cross the road to the shopping streets. Of the two parallel streets take the one to the left closer to the H &M not the one across from the New Balance and walk for a few minutes, the bar will be on your right down the stairs.